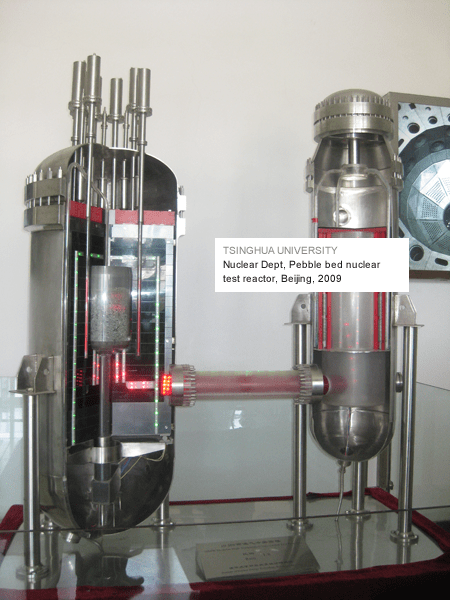 The pebble bed reactor (PBR) is a graphite-moderated, gas-cooled, nuclear reactor. 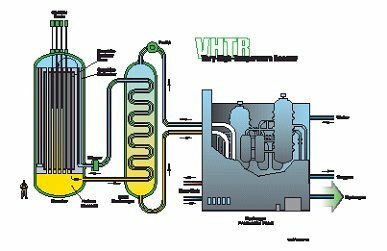 It is a type of very high temperature reactor (VHTR), one of the six classes of nuclear reactors in the Generation IV initiative. Like other VHTR designs, the PBR uses TRISO fuel particles, which allows for high outlet temperatures and passive safety. 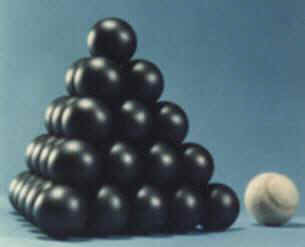 The base of the PBR’s design is the spherical fuel elements called pebbles. These tennis ball-sized pebbles are made of pyrolytic graphite (which acts as the moderator), and they contain thousands of micro fuel particles called TRISO particles. These TRISO fuel particles consist of a fissile material (such as 235U) surrounded by a coated ceramic layer of silicon carbide for structural integrity and fission product containment. In the PBR, thousands of pebbles are amassed to create a reactor core, and are cooled by an inert or semi-inert gas such as helium, nitrogen or carbon dioxide. The technology was first developed in Germany but political and economic decisions were made to abandon the technology. 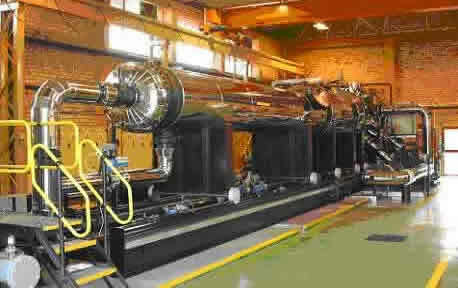 In various forms, it is currently under development by MIT, University of California at Berkeley, the South African company PBMR, General Atomics (U.S.), the Dutch company Romawa B.V., Adams Atomic Engines , Idaho National Laboratory, and the Chinese company Huaneng. 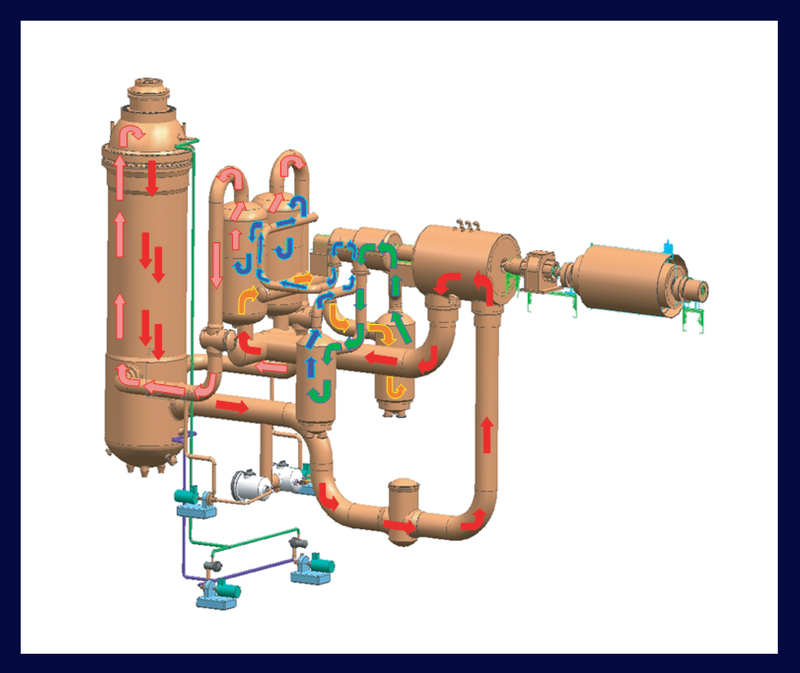 A pebble bed power plant combines a gas-cooled core and a novel packaging of the fuel that dramatically reduces complexity while improving safety. The uranium, thorium or plutonium nuclear fuels are in the form of a ceramic (usually oxides or carbides) contained within spherical pebbles a little smaller than the size of a tennis ball and made of pyrolytic graphite, which acts as the primaryneutron moderator. 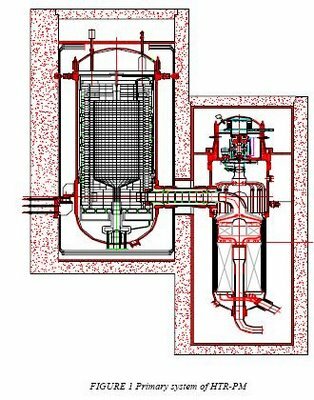 The pebble design is relatively simple, with each sphere consisting of the nuclear fuel, fission product barrier, and moderator (which in a traditional water reactor would all be different parts). Simply piling enough pebbles together in a critical geometry will allow for criticality. 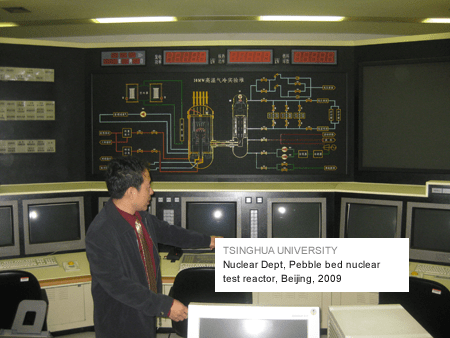 The most common criticism of pebble bed reactors is that encasing the fuel in combustible graphite poses a hazard. 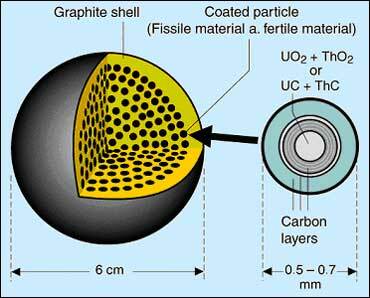 When the graphite burns, fuel material could potentially be carried away in smoke from the fire. Since burning graphite requires oxygen, the fuel kernels are coated with a layer of silicon carbide, and the reaction vessel is purged of oxygen. While silicon carbide is strong in abrasion and compression applications, it does not have the same strength against expansion and shear forces. 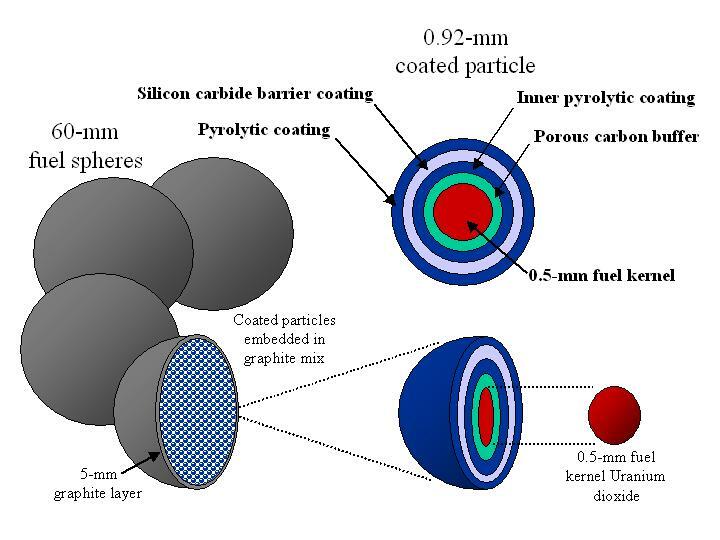 Some fission products such as xenon-133 have a limited absorbance in carbon, and some fuel kernels could accumulate enough gas to rupture the silicon carbide layer. Even a cracked pebble will not burn without oxygen, but the fuel pebble may not be rotated out and inspected for months, leaving a window of vulnerability. 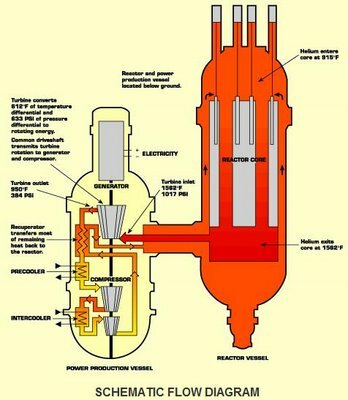 Some designs for pebble bed reactors lack a containment building, potentially making such reactors more vulnerable to outside attack and allowing radioactive material to spread in the case of an explosion. 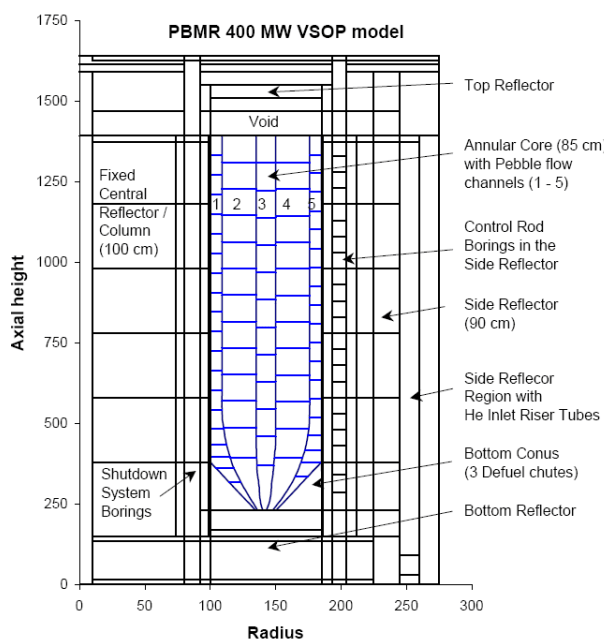 However, the current emphasis on reactor safety means that any new design will likely have a strong reinforced concrete containment structure. Also, any explosion would most likely be caused by an external factor, as the design does not suffer from the steam explosion-vulnerability of some water-cooled reactors. Since the fuel is contained in graphite pebbles, the volume of radioactive waste is much greater, but contains about the same radioactivity when measured in becquerels per kilowatt-hour. The waste tends to be less hazardous and simpler to handle. 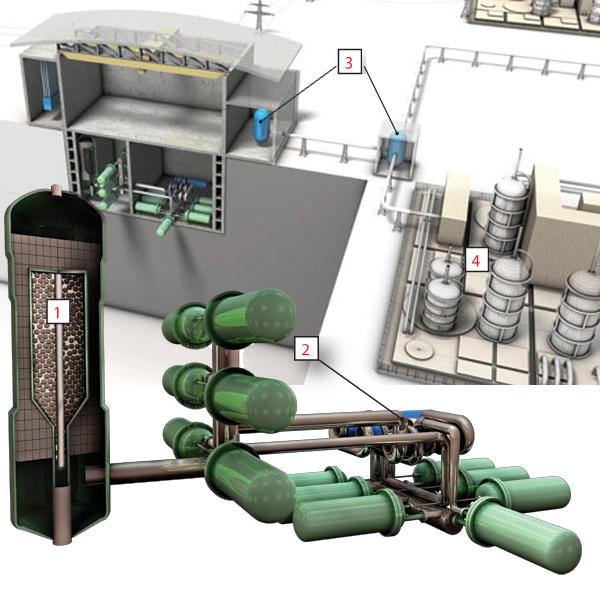 Current US legislation requires all waste to be safely contained, therefore pebble bed reactors would increase existing storage problems. Defects in the production of pebbles may also cause problems. The radioactive waste must either be safely stored for many human generations, typically in a deep geological repository, reprocessed, transmuted in a different type of reactor, or disposed of by some other alternative method yet to be devised. The graphite pebbles are more difficult to reprocess due to their construction, which is not true of the fuel from other types of reactors. Proponents[who?] 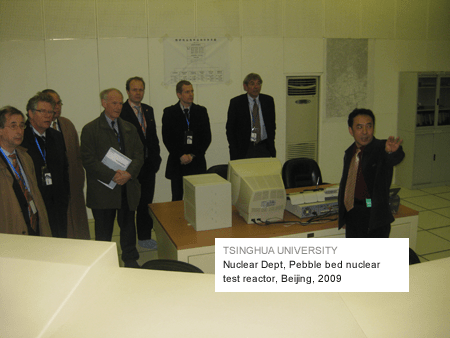 point out that this is a plus, as it is difficult to re-use pebble bed reactor waste fornuclear weapons. 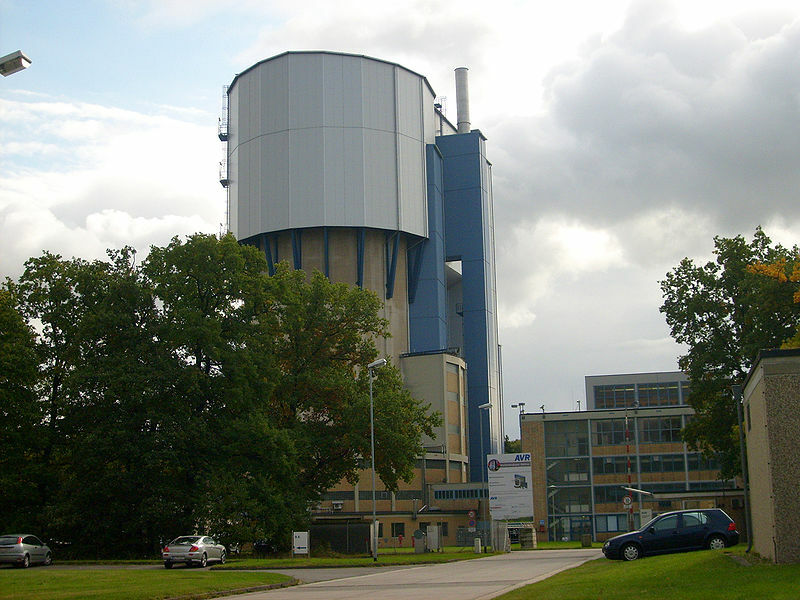 Critics also often point out an accident in Germany in 1986, which involved a jammed pebble damaged by the reactor operators when they were attempting to dislodge it from a feeder tube (see THTR-300 section). This accident released radiation into the surrounding area, and probably was one reason for the shutdown of the research program by the West German government. Contamination of the cooling circuit with metallic fission products (Sr-90, Cs-137) due to the insufficient retention capabilities of fuel pebbles for metallic fission products. Even modern fuel elements do not sufficiently retain strontium andcesium. 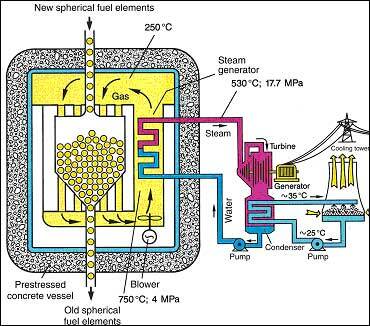 The pebbles are held in a vessel, and an inert gas (such as helium, nitrogen or carbon dioxide) circulates through the spaces between the fuel pebbles to carry heat away from the reactor. If helium is used, because it is lighter than air, air can displace the helium if the reactor wall is breached. 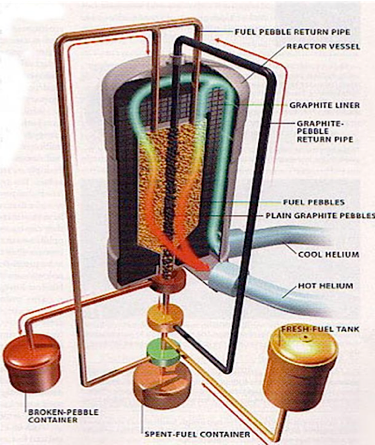 Pebble bed reactors need fire-prevention features to keep the graphite of the pebbles from burning in the presence of air although the flammability of the pebbles is disputed. 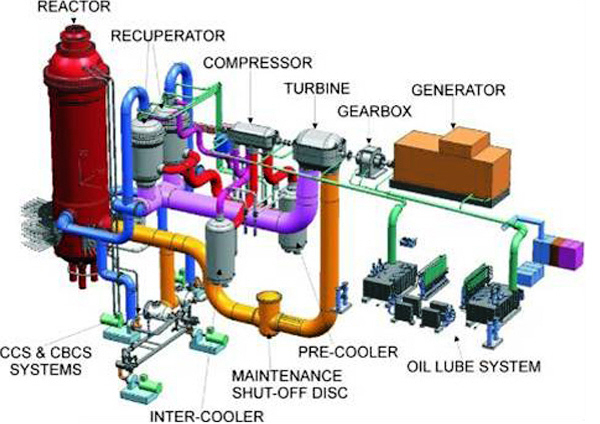 Ideally, the heated gas is run directly through a turbine. 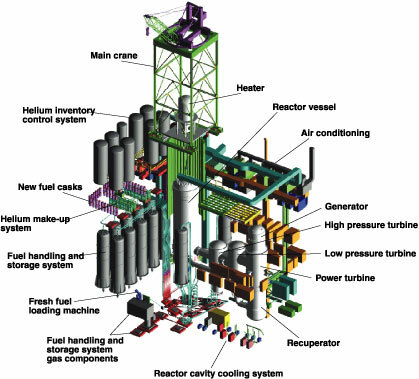 However, if the gas from the primary coolant can be made radioactive by the neutrons in the reactor, or a fuel defect could still contaminate the power production equipment, it may be brought instead to a heat exchanger where it heats another gas or produces steam. The exhaust of the turbine is quite warm and may be used to warm buildings or chemical plants, or even run another heat engine.